Fluence Analytics ARGEN platform continuously measures the light scattering from 16 independent solutions to assess the pharmaceutical stability of therapeutic proteins and natural polymers. ARGEN applies temperature and stirring stressors independently to each of the 16 sample cells, replicating the conditions of and monitoring the sample in commonly encountered environments. Unparalleled amongst any other platform on the market, ARGEN users can remove, replace or extract aliquots from any of the 16 sample cells without interfering with any other ongoing measurement. ARGEN leverages the phenomenology known as Total Intensity Light Scattering (a.k.a Static Light Scattering) and continuously delivers essential qualitative and quantitative information about each sample. The instrument collects and produces realtime sample aggregation information, identifies anomalous aggregation initiation delays and calculates the rate and total time that the process takes to reach a predetermined aggregation condition. This information is interpreted and used to provide detailed reports that reveal the samples degree and rate of mass change. This technical note explains both how ARGEN quantitatively measures sample stability and the measurable benefits gained from using the instrument. 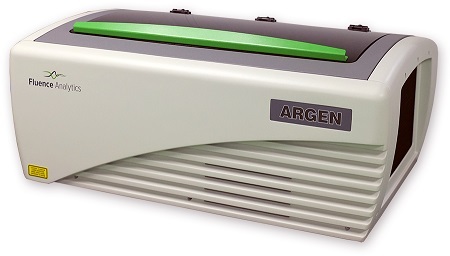 To characterize the molecular weight and stability of polymers, proteins and other natural products, ARGEN uses Total Intensity Light Scattering, also referred to as Static Light Scattering, the widely accepted standard method. ARGEN, however, has three characteristics that differentiate it from other, similar technologies. First, to test many configurations simultaneously, ARGEN has 16 independent sample holders, each with precise temperature and stirring stressor control. No other testing platform has independent sample conditions. Second, to detect and calculate the degree and rates of aggregation, ARGEN continuously monitors each sample throughout the entire aggregation process. Finally, for samples undergoing degradation, ARGEN enables users to calculate both the decrease in molecular weight and changes in the rate. Swap in and out a sample from any cell without affecting the others. Control the thermal, mechanical and chemical stressors for each cell. Constantly monitor and reveal the kinetics of the sample evolution. Test high and low sample concentrations with its large dynamic range. Test sample volumes ranging from 30μL to 3.5mL. Early detection of aggregation, degradation and particle formation. Calculate molecular weight and virial coefficients with absolute light scattering measurements. ARGEN’s identification of aggregation and degradation rates results from the unique stressor conditions applied for each solution. For thermal stress, each of the 16 cells has independent, precise and programmable temperature setting ranging from 18°C to 150°C. For mechanical stress, ARGEN agitates the sample with a magnetically coupled stir bar. The stir bar feature is equipped with precise stepper motor control capable of 1 to 2,000 rpm in either clockwise or counter-clockwise directions. For rapid scanning of temperature regimes, ARGEN conducts a thermal ramp with a few simple user inputs: initial temperature, final temperature and a time interval for the ramp duration. Similarly, but independently, users can vary and ramp ARGEN’s stirring rate during an experiment. While screening with ramp tests is useful, ARGEN’s most powerful feature is conducting multi-sample isothermal temperature studies. Isothermal screening helps the user determine actual aggregation kinetics under precise and controlled temperature conditions. 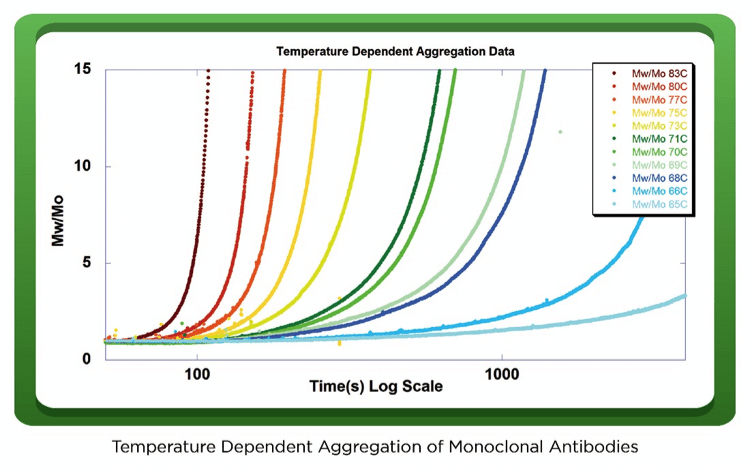 It is important to note that there is no unique ‘aggregation temperature’ for proteins since they aggregate over wide temperature ranges. ARGEN generates aggregation rates and behavior over the largest range of stressor conditions of any commercially available sensor. Figure 2 displays time dependent iso-thermal light scattering results for 11 samples, each set to a different temperature. In the figure, each curve represents that sample’s time dependent relative molecular weight (Mw(t)/Mo). Mw(t)/Mo is a normalized, dimensionless measure of molecular weight with respect to the initial, non-aggregated sample mass. Mo is the molecular weight of the native, unaggregated protein, and Mw(t) is the weight average molecular weight of combined aggregates and native protein at any instant of time, t. Changes in Mw(t) represent proportional changes in the sample’s aggregate mass and concentration. Each of the 11 samples shown in Figure 2 represents a different isothermal temperature, red representing the highest temperature and blue representing the lowest temperature. ARGEN is unique in that it can determine each sample’s AR using the early, linear portion of each curve. This set of experiments clearly shows the relative sample stability with temperature. Figure 2: The time dependent relative molecular weights for 11 independent samples, each with a unique and distinct temperature. Aggregation Rate is derived from the change in Mw/Mo. In addition to stressor tests, ARGEN can probe formulation stability with independent and continuous testing. Users can explore the effects of concentration, pH, ionic strength and excipients on formulation stability by preparing a protein or polymer sample at varying conditions. When combined with ARGEN’s thermal and mechanical stressor variability, users can explore formulation stability in extreme detail. Figure 3 shows an example of formulation stability test results for a single biologic with three different pH level formulations and equal thermal and mechanical stress. Figure 3 clearly shows that under identical stress conditions, pH levels can strongly affect aggregation rates. Performing pH or other formulation dependent experiments before or after processing can quickly identify downstream processing inefficiencies that lead to aggregation and the loss of valuable product. Figure 3: ARGEN shows the Aggregation Rate’s dependence on formulation makeup. Here, for identical stressor conditions, formulations with different pH values aggregate at different rates. Stirring-induced protein solution instability is related to several factors: the type of stirring (contact vs non-contact), absence or presence of an air/liquid interface, sample volume, shear stress and the types of materials in contact with the solution. ARGEN enables multi sample and formulation testing by running simultaneous tests with and without air/liquid interfaces, at different volumes, and with different materials for the stir bar surface. In the presence of an air-liquid interface, under stirring stress protein formulations can exhibit a wide range of AR values. Additionally, transferring or stirring biologics during downstream processing leads to unavoidable contact with material interfaces. By suspending a small sample of metals, plastics or other materials within the sample cell, ARGEN can quickly test the interactions that biologics will experience and preemptively determine aggregation likelihood during processing. With ARGEN users can selectively schedule longer, more detailed characterization tests such as Gel Permeation Chromatography (GPC). As shown in Figure 4, ARGEN’s Mw/Mo characterization quickly identifies abnormal or undesired trends. Rapid trend ID accelerates formulation understanding leading to optimized development and testing pathways. The ubiquitous but low throughput testing (i.e. GPC) often takes significantly longer to conduct while producing less realtime, kinetic information. ARGEN substantially reduces inefficient testing frequency, consequently, accelerating the R&D period of biologic development. Figure 4 is a representative example of data that contains an undesirable trend. Here, Mw(t)/Mo is displayed on the right-hand y-axis, and the GPC elugram as represented by UV absorption data is on the left-hand y-axis. The overlay of the data shows that Mw/Mo highlights the outliers within the experimental set. 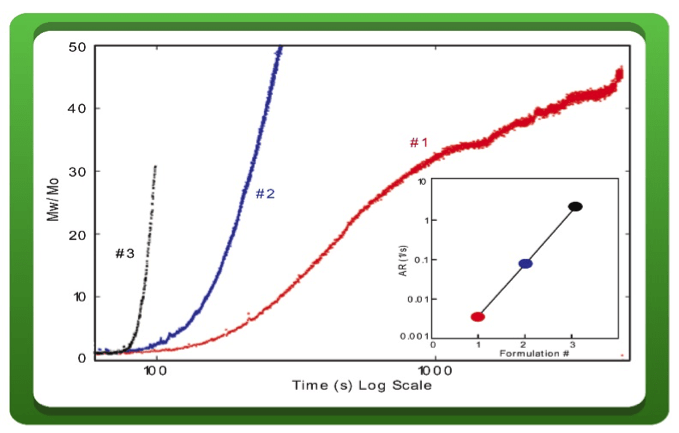 Figure 4: ARGEN Data reveals continuous Aggregation Rate and Relative Mass change while GPC analysis reveals discrete protein monomer depletion and aggregate mass evolution. Understanding formulation’s dissolution kinetics is an important part of optimizing development and preparing further candidate protein testing. By monitoring the light scattering signature of a sample as it is dissolving, ARGEN’s continuous monitoring capability allows for accurate determination of dissolution rates and degree of completion under varying conditions of temperature and formulation makeup. Quantitative solubility characterization ensures that precious protein samples are sufficiently dissolved prior to further filtration or testing, thus eliminating the loss of sample or inaccurate characterization by other methods. 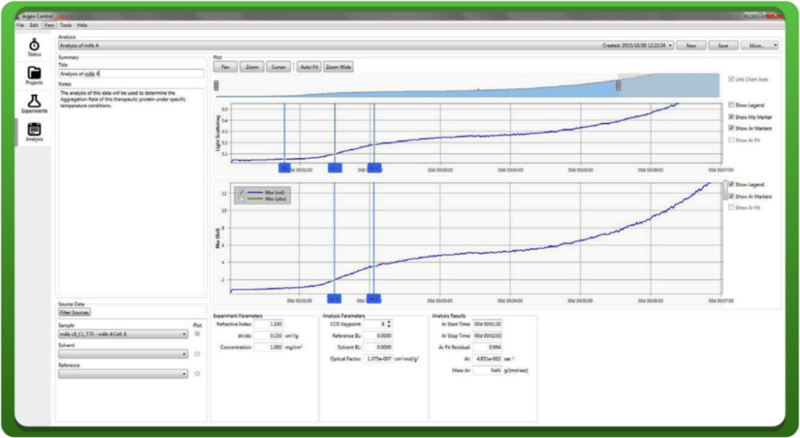 The ARGEN platform includes a Control and Analysis software that enables users to easily configure, monitor and manipulate experiment conditions in real time. Users also have the ability to view (Figure 5) and interpret past or current experiments and effortlessly determine the AR for a sample. To identify the AR as a function of Mw(t)/Mo, users can select ranges of aggregation data and ARGEN automatically performs the calculations. In Equation 1, Mw(t)/Mo represents the time dependent molecular weight divided by the initial molecular weight of the sample. AR is the derivative of the Mw(t)/Mo with respect to time during the early, linear phase of aggregation. With solvent and reference value input, ARGEN also characterizes the kinetic change in weight average molecular weight of the sample. By using the early linear regime of Mw(t)/Mo, ARGEN’s AR values show good reproducibility. Most importantly ARGEN reduces total sample processing time by detecting and quantifying very small changes in Mw(t)/Mo. Figure 5: The ARGEN Control software interface is an intuitive, easy to use, all-inclusive platform that enables users to: quickly check on sample status, calculate Aggregation Rates and manipulate experimental stressor parameters in real time. ARGEN is an essential, cost saving, next-generation instrument for realtime, continuous testing and characterization of biopharmaceutical and natural and synthetic polymer applications. Other available characterization methods rely heavily on time and cost intensive single point characterization techniques such as SEC. Because protein aggregation is a kinetic process, the direct, continuous, quantitative monitoring of the process provides the most compelling means of understanding the process. For biopharmaceutical and natural polymer applications, ARGEN reveals material sensitivity factor insights such as: formulation and protein sequence variants and for stressors such as temperature, stirring, shear stress, air-liquid interfaces, different surfaces and ions.